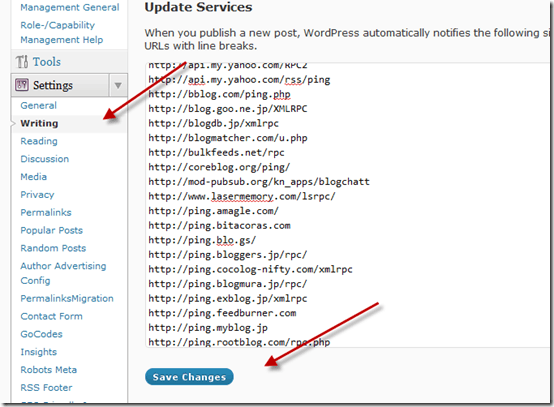 When ever you publish, edit or modify a post, WordPress sends ping to all the Ping services which is listed under your ping update service. So this way, ping services get notified about new post and search engine will quickly index them. Now by default WordPress notifies all major ping services but we can always extend our limit by pinging more services by adding them manually. Over the time, I have compiled a list of ping services for WordPress, which will help you to ping more services. Here is list of my working WordPress ping list. Well, controlling WordPress ping update services is just first step to SEO and there are many things which you need to do to SEO optimization of your blog. You can refer to my WordPress guide for more comprehensive and detailed post on WordPress. WordPress is not SEO friendly and how to fix it? I think I heard pjera.com mentioned at Mashable…nice work here!